Welcome to my portfolio! Here you will find my most recent short-form copy. Season inspired designs I created in Adobe InDesign and Illustrator. If inspiration strikes I just roll with it, while working on back to school vectors I felt more inclined to create something for all four seasons and not just one specific time a year. For winter I went with a traditional snowflake wallpaper vibe, and for spring I wanted something fresh but thought flowers to be too trite. So I opted for cupcakes instead, to me they’re light, fluffy, and colorful just like spring. Playing off the desire to stay cool, summer utilizes a bright background with cooler palleted icons. Autumn takes on earthy tones and familiar imagery of acorns and pumpkins. With International Women's Day around the corner and I wanted to pay homage to women in STEM. My goal for the science fair poster was to ignite a desire for young girls to participate if they saw it hanging in their school. Not only are there recognizable science symbols on it, there is also someone who looks like them front and center. "What if the periodic table described women?" was the only thought I had before creating my second design. To keep it true to life, I filled in all the existing elements I could and used positive adjectives to fill in the remaining squares. Empowerment was the inspiration of my creative energy this month and I hope it's the spark necessary to begin making 2018 the best year possible. In high school I took a multimedia class that taught us Adobe products like Premiere Pro, After Affects, and Photoshop. During the Photoshop section we created a galaxy with planets and moons; recently I found myself wondering what the same picture would look like with a flatter look designed with Adobe Illustrator. Being unfamiliar with the program, I took to the internet to find tutorials on how to craft a realistic moon and continents for planet earth, and thus began my weekend teaching myself Illustrator had commenced. 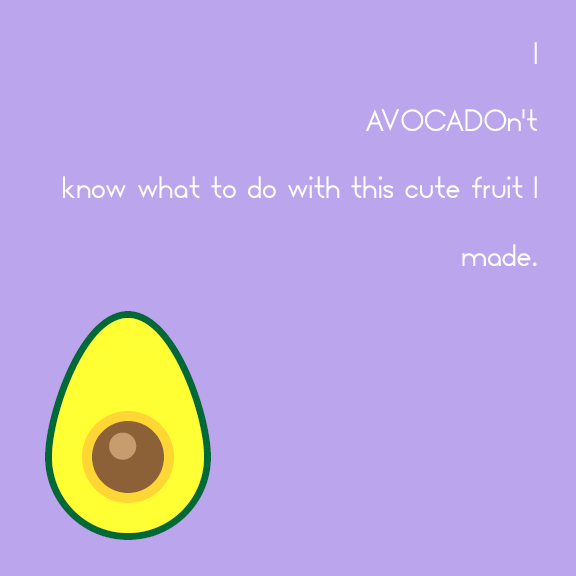 Stumbling upon a fruit tutorial was really the best thing that ever happened to me, you know designing wise. I was able to ease my way into learning many tools of the Illustrator program and got to play with color combos too! This adorable robot is another product of my Illustrator weekend. By following a shape forming tutorial, I was able to construct this simple robot. What's cuter than a small bot and a quick message? Yeah, I couldn't think of anything else either. This is the profile picture and cover photo I created for my new Facebook Page Jasmine Barr Marketing Consultant. I wanted simple images that looked professional, inviting, and stayed true to the theme of my brand; purple accents, Amble font, and overall chill vibes. The idea behind creating my own page was to have a centralized place to share my work without flooding my friends newsfeeds. I know that the people who like my page want to see the content and I can reach so many more people. One thing Drake University's Community Action Board (CAB) held as a major goal this past year was building a foundation to begin adjusting the way students viewed the surrounding neighborhood. As a member of CAB's Neighborhood Relations Committee, I had the idea of applying the negative things you could overhear students saying about the neighborhood natives towards the students themselves. Just like that, these posters for CAB's neighborhood perception dialogue were born. Upon viewing the exchanges shown on the posters, we wanted students to stop and think about how their words and actions were effecting those around them. In addition to motivating them to attend the dialogue on campus. Behold, my tech savvy and disgustingly creative way to apply to Nickelodeon, a subsidiary of Viacom. They were looking for a Social Media Manager and I was looking for a way to help myself standout; you know besides being a complete Nicktoon Stan. I decided the best route to take was making a Snapchat Geofilter, that way even if someone directly from the HR office didn't see it, someone who knew them could show it to them. I was going to pay for my filter to be in half of the Viacom building for about an hour and a half around lunchtime. Unfortunately, Snapchat labeled my filter as spam and it never got used. In their defense it used to include a QR code that led to my Linkedin Profile. Once I removed it, I resubmitted my Geofilter and it was rejected a second time for the same rationale. This is the logo design I can came up with for a new scenario board game entitled Marooned that will soon be available for purchase. Marooned is an off-the-cuff survivalist strategy game, I really wanted to stress that feeling of being deserted and a tad dusty through the font and play up the obvious pun through the color scheme. The marketing department at Drake University was looking for student generated content to help with the #bringdraketodrake campaign to encourage the esteemed rapper to visit the campus of the same name in Des Moines, IA. 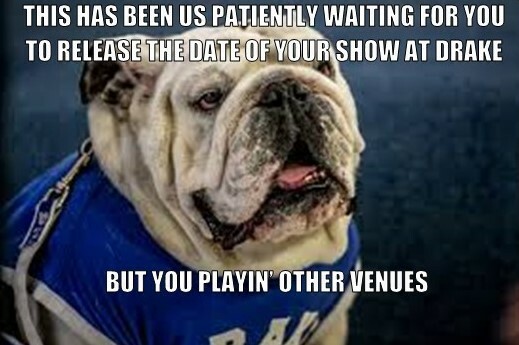 Not one to leave a pun unspoken, I thought up with some dank memes to spread around campus in the hopes that they would go viral enough to gain Drake's attention. One of my memes made it into a Des Moines Register article, which is just fine. Oh and Drake visited the campus too 😉. When I was the Fellowship Vice President of my service fraternity I created a promotion to increase attendance at the events I hosted while in office. These are the two flyers I made to spread the word each semester I was running the promotion. A simple invite I designed to go with the Spring Formal I threw for my service fraternity as the Fellowship Vice President. In past years the Fellowship Vice President only told the chapter when the formal was and entrusted everyone wrote it down. To change things up I emailed this invitation to everyone, posted it in our Facebook Group, and added it to our weekly report to ensure members had multiple outlets to check for the information included if necessary. This Facebook cover photo was among the first few items I created when beginning my journey using InDesign and Photoshop. The service fraternity I was a member of during college was hosting our annual spring recruitment to gain new members and wanted something to share on Facebook that would be eye catching and show a uniform look among active members.